Software Asset Management Capability Statement for Federal Agencies. 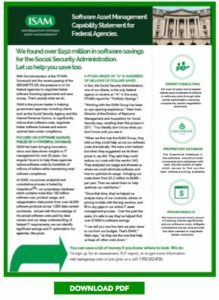 We found over $150 million in software savings for the Social Security Administration. Let us help you save too. With the introduction of the FITARA Scorecard and the recent passing of the MEGABYTE bill, the pressure is on for federal agencies to negotiate better software licensing agreements and save money. That’s exactly what we do. ISAM is the proven leader in helping government agencies, including clients such as the Social Security Agency and the Internal Revenue Service, to significantly reduce their software costs, negotiate better software licenses and ensure optimal data center compliance. FOCUSED ON SOFTWARE SAVINGS; FUELED BY A POWERFUL DATABASE. ISAM has been bringing innovation, vision and data-driven insights to IT management for over 20 years. Our singular focus is to help these agencies reduce software costs by hundreds of millions of dollars while maintaining total software compliance. At ISAM, our proven analytical and consultative process is fueled by GreenBookSM– our proprietary database which contains more than 100 million software cost, product usage, and categorization data points from over 64,000 software products across 1,000 data centers worldwide. Armed with the knowledge of the actual software costs paid by data centers and our deep understanding of federal IT requirements, we can identify significant savings and IT optimization for agencies, like yours. A FITARA GRADE OF “A” & HUNDREDS OF MILLIONS OF DOLLARS SAVED. In fact, the Social Security Administration, one of our clients, is the only federal agency to receive an “A” in the every FITARA report for “Portfolio Savings.” “Working with the ISAM Group has been an eye opening experience,” Mark Irwin, Director of the Division of Resource Management and Acquisition for Social Security says, recalling their first project in 2011. “You literally don’t know what you don’t know until you see it. Effective License Position (ELP) report supporting software audits • A comprehensive analysis of your entire software portfolio. Development of software strategy and tactics aimed at maximizing future software savings and data center optimization. Studies of your current software to determine the most advantageous pricing metrics and product bundling options. • Reconciliation of your deployment and usage with your contract terms so you’re fully compliant. In-depth use of competitive pricing data for our proprietary GreenBook database to maximize your negotiating leverage. • Recommendations to achieve the lowest possible cost structure. Analysis and recommendations from a team of consultants with over 20 years of experience assisting the government agencies in their dealings with the largest global software vendors. You can save a lot of money if you know where to look. We do. To sign up for an assessment, ELP report, or to get more information just give us a call: 1.952.322.4726.